Occur on rocky reefs and muddy substrates of the continental shelf and upper slope, forming dense schools close to the bottom at dawn and dusk and dispersing throughout the water column at night to feed (Ref. 9563). Juveniles also aggregate in schools (Ref. 33987) and are found in estuaries and shallow costal waters (Ref. 9833). Feed on small fish, crustaceans and mollusks. Renamed Redfish for marketing purposes. Swallowtail (Centroberyx lineatus) is also a type of redfish, but is sold only in small quantities. Western Pacific: eastern Australia from western Bass Strait and north eastern Tasmania to Moreton Bay, Queensland. 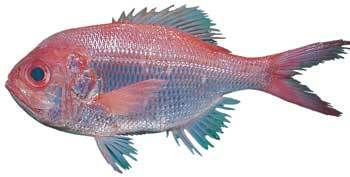 Also found in New Zealand; recently recorded from the Chesterfield Islands and New Caledonia . 51.0 cm SL (male/unsexed); max. published weight: 2,000 g.
A very popular fish, flesh white, medium texture, suitable to most cooking methods, suitable for sashimi. Redfish fillets (always sold skinned) are a very economical purchase. Redfish heads and frames are good for finfish stock. Redfishes are ideally suited to baking, shallow frying and grilling. An excellent method of preparation for these species is the Cajun style of marinating or coating the fillets in red chilli, ground cumin and coriander and cooking them over a very high heat. This will create what is known traditionally as the blackened finfish a style that will add to the piquancy of flavour. Redfishes also lend themselves well to the creation of bouillabaisse or to use in braised finfish dishes, with tomato and fennel. They are highly regarded as a major ingredient in fish cakes, quenelles, finfish balls, croquettes or gefilte fish as the flesh has good jelling characteristics, requiring very little binder. Redfishes are ideal for large-scale catering. Try creating a soup combining chopped redfish fillets, watercress, shallots, milk and cream. The Bight redfish is larger than the redfish (Centroberyx affinis), but is equally flavoursome and versatile. Both are quite inexpensive, make excellent eating and are available as plate-size finfish or skinless fillets. Colour of Raw fillet: White to pale pink. Flavour: Delicate, sweet to mild.